Pick up your free copy of Underwater Photography Made Easy! Once you see how easy it is to capture your underwater experience with your SeaLife Camera, you want to do it again and again. This enhanced eBook for the iPad® will help you learn about underwater photography and video. SeaLife Cameras are a great way to capture memories underwater whether you want to capture images in the swimming pool or are a beginner snorkeler, diver, or more advanced diver and want to start underwater imaging. Professional underwater photographer and filmmaker Annie Crawley created this guide for SeaLife Cameras to give you professional tips and tricks so you can take amazing underwater photographs and video with your system. Through this enhanced eBook, you will learn easy to apply tips and tricks to help you create great images. Five quick review steps ensure your SeaLife camera system is ready before every dive, plus neutral buoyancy tips to help you take great underwater photos & video with your SeaLife camera system. Included are sections on macro and wide angle photography and video basics including color, composition, understanding the rule of thirds, leading diagonals, foreground and background considerations, plus lighting with strobes and video lights. You will learn how to capture sharks, turtles, dolphins, clownfish, plus so much more. 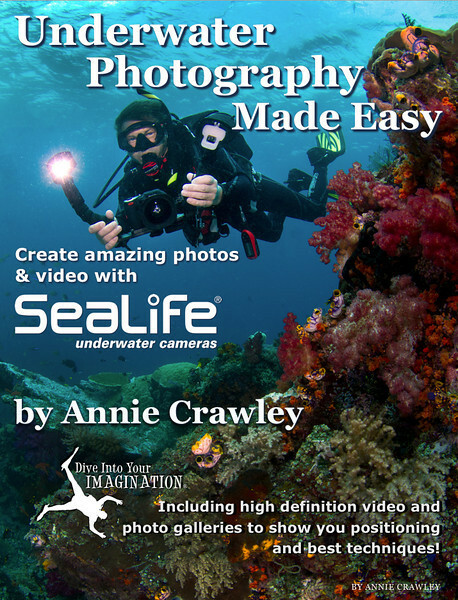 This is a great enhanced eBook if you would like to learn about underwater photography and video.